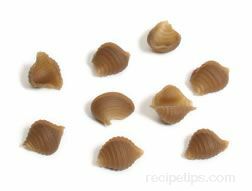 Shaped Pasta - such as cavatelli, conchiglie, farfalle, fusilli, gemelli, gnocchetti, gramigna, lumache, lumaconi, orecchiette, radiatori, route, torine, and trenne. Use thick tomato sauces, pesto, sauces with herbs, meat sauces, chunky sauces, and cheese sauces. 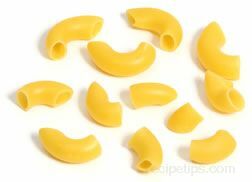 Tubular Pasta - such as canneroni, cannolicchi, cavatappi, garganelli, macaroni, maccheroncelli, manicotti, paccheri, penne, rigatoni, tortiglioni, and ziti. Use thick tomato sauces, meat sauces, chunky sauces, and thick cream sauces. Pasta . Strand Pasta - such as angel hair, capellini, chitarra, fedelini, spaghetti, and vermicelli. Use light tomato sauces, butter based sauces, purées that are thick such as basil or pepper purées, light oil based sauces such as olive oils, and light cream based sauces. Ribbon Pasta - such as fettuccine, lasagne, linguine, pappardelle, riginette, tagliatelle, and trenette. 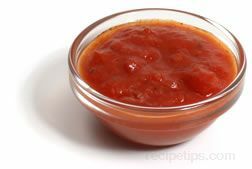 Use meat sauces, thick tomato sauces and thick cream sauces for wider dried pasta or on narrow or fresh pastas, use light tomato sauces, butter based sauces, light oil based sauces, and light cream based sauces. Soup Pasta - such as acini di pepe, alphabets, anellini, conchigliette, ditali, farfalline, orzo, pastine, risi, stele, stortini, and tubetti. Use light sauces that are used mainly in the soup broths or in soups with a light base. Stuffed Pasta - such as agnolotti, pansotti, ravioli, tortelli, and tortellini. Use light tomato sauces, light cream based sauces and broth. A few of the common sauces used for pasta include Alfredo, Arrabbiata, Béchamel, Classic, Carbonara, Formaggi, Madeira, Marinara, Marsala, Pesto, Puttanesca, Ragù, Romesco, and Vodka sauce, which are briefly described below. For a more thorough explanation, look up the sauce desired in the glossary. Alfredo Sauce - a common sauce for use with fettuccine noodles to make a dish referred to as fettuccine Alfredo. 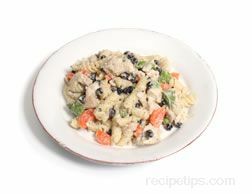 The sauce consists of heavy cream or half and half that is mixed with butter, grated Parmesan cheese, pepper, and occasionally nutmeg. Arrabbiata Sauce - one of the spicier types of tomato sauces made with chile peppers that add a more intense flavor to pasta, meats, poultry, seafood, and other foods such as pizza. 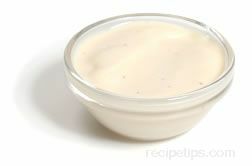 Béchamel Sauce - a basic white sauce made by adding hot milk to a white roux (heated butter mixed with flour). 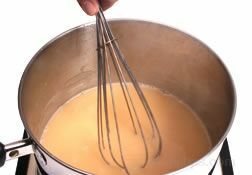 The roux thickens the milk into a creamy white sauce which can then be seasoned with additional ingredients depending on the type of dish served with the sauce and the flavors desired. Bolognese Sauce - a traditional Italian red sauce originating in Bologna, Italy. Most often a Bolognese sauce will contain at least two types of meat, which may include veal, beef, pork, or chicken cut into small pieces. Unlike some sauces that use ground meat, traditional Bolognese sauces start with large pieces of meat that are sliced to be chopped into small, finely cut bits. The meat becomes part of a variety of ingredients such as onions, celery, carrots, chile peppers, tomatoes, olive oil, and white wine that are combined with seasonings and herbs such as oregano, basil, bay leaves, and nutmeg that provide the distinct flavor for the sauce. It is also common to add cream or milk to the ingredients which provides a richer flavor to the sauce. Classic Sauce - a sauce made with traditional or country ingredients in a rustic style of preparation comparable to the region from which it was created. 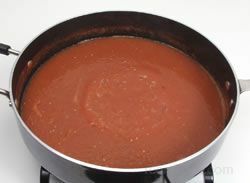 Most always prepared as a red sauce, the ingredients may include tomatoes, diced vegetables, olive oil, and seasonings. It is a sauce that is commonly served as a pasta sauce as well as a sauce for poultry and fish dishes. Carbonara Sauce - a sauce made with cream, eggs, Parmesan cheese, small pieces of bacon and vegetables, such as peas. Although any type of pasta can be used, spaghetti and linguine are most suitable with this sauce. When this sauce is made, it is heated for several minutes until it begins to thicken, when it is then spread over pasta that is very hot, enabling the eggs to continue cooking while the food simmers. Madeira Sauce - a wine sauce typically made from Madeira wine and broth, but also with other ingredients that enhance the flavors of the foods topped with the sauce. Madeira sauces are typically used to season pasta, meats, stews, and savory dishes. Marinara Sauce - a highly seasoned tomato sauce made with garlic and other ingredients, such as onions, parsley and olives. The sauce is used on meats and pasta. Marsala Sauce - made from a variety of flavored bases such as tomatoes, mushrooms, or fruit flavors to be served as a sauce for several traditional food dishes such as pollo (chicken) marsala or veal marsala. A typical recipe for the sauce may include onions, garlic, herbs, mushrooms, heavy cream, oil or butter, and the key ingredient, Marsala wine, which is often used as a demiglaze, or added last. Puttanesca Sauce - a very spicy and strong flavored sauce made with garlic, bits of dried chile peppers, capers, and anchovies as key ingredients. It can be mild or well seasoned depending on the type and amount of spices added, to be served on fish and pasta dishes. Ragù Sauce - made from ingredients that can cook for longer periods of time, a ragù traditionally includes bits or minced beef cooked with chicken livers and unsmoked pancetta which is combined with tomato purée, mushrooms if desired, onions, celery, olive oil, seasonings, cheese, and white wine. Today other ingredients are also added to make a tomato based red sauce or a cheese based white sauce. Ragù is served in lasagna, ravioli and over pasta. This sauce may also be referred to as Bolognese sauce. Romesco Sauce - a sauce often served over grilled foods such as fish, poultry, meats, and vegetables or used as a flavoring for stews and pasta dishes and breads topped with meats and cheese. Considered by some to be a garlic sauce, Romesco is most often made with tomatoes, garlic, olive oil, blanched almonds, hazelnuts, vinegar, herbs, red chile peppers, and salt. Vodka Sauce - a creamy textured pasta sauce that goes well with penne, ravioli, rigatonni, tortellini, or ziti pasta as well as on some poultry dishes or bruschetta appetizers. Rich in flavor, this sauce typically contains tomatoes, cream, vodka, olive oil, garlic, onions, and seasonings. Parmesan, pecorino or romano cheese and meats such as prosciutto are also additional ingredients that may be included in some vodka sauces.